I've spent the last couple of nap times transforming the office into a sewing room. 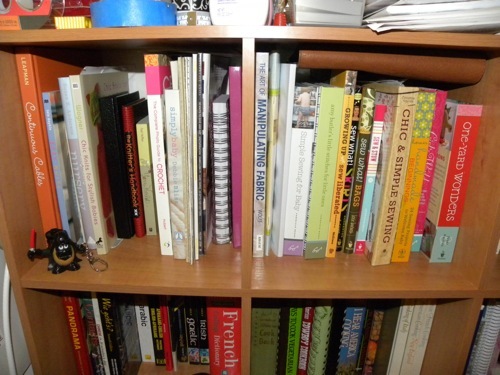 Since Paul usually studies at the library (because our apartment is definitely not quiet and the girls are determined to find Daddy if he's around) I moved his books out onto the bookshelves in the bedroom, and moved my craft and cooking books in. I'm really excited with the outcome! And of course, I had to snap a few photos. 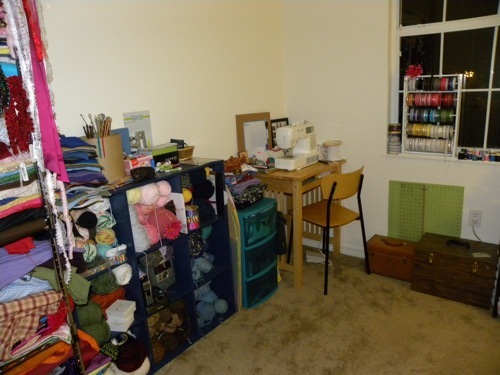 Here's my yarn stash, and sewing area... The wooden boxes are filled with beads and rosary parts. "Where is my Real Mommy!" Princess Dress Ribbon and "Jewels." 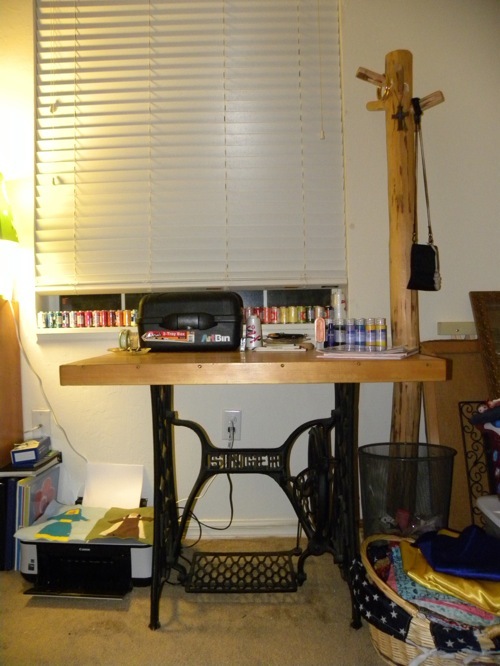 Another picture of my work space! Sadie spent a while playing with the pedal while I was cleaning the room. 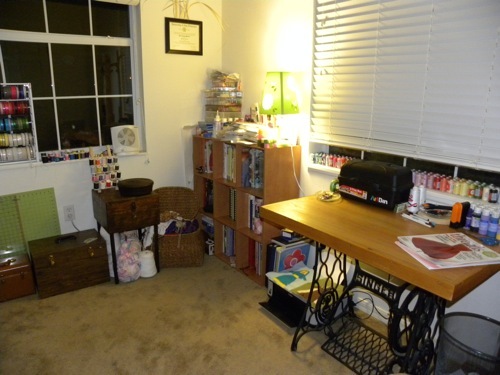 I'm so excited to have my craft books in one place in my sewing room! It's going to make it much easier to look things up! 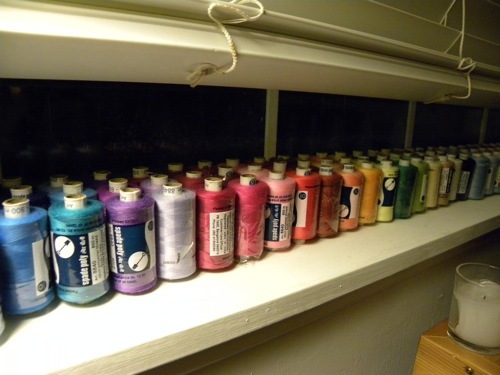 More fabric. Because apparently that giant shelf that goes up to the ceiling, isn't big enough. I should explain why my fabric... problem... can't really go away while I still have my shop. The thing is, when I buy fabric I buy several yards. 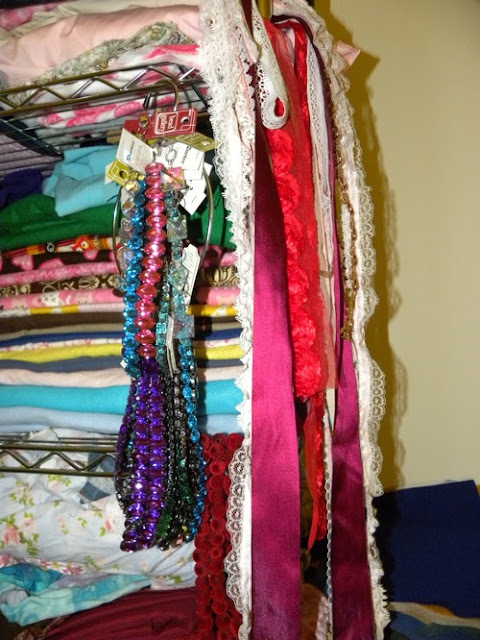 I can make roughly six headcoverings with two yards... But I don't right away... 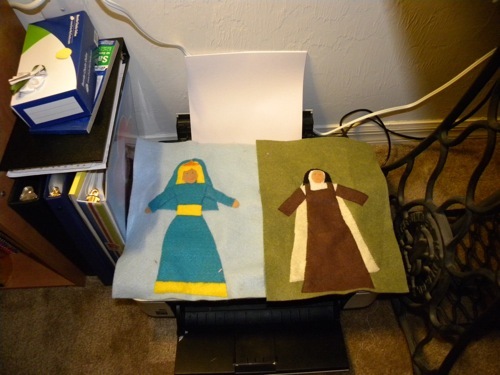 I make a snood, and maybe a convertible headcovering and put the rest of the fabric away, for future headcoverings. It works really well for the shop... however... it doesn't save much space! And here's the finished room! I think this will make work a lot more efficient. 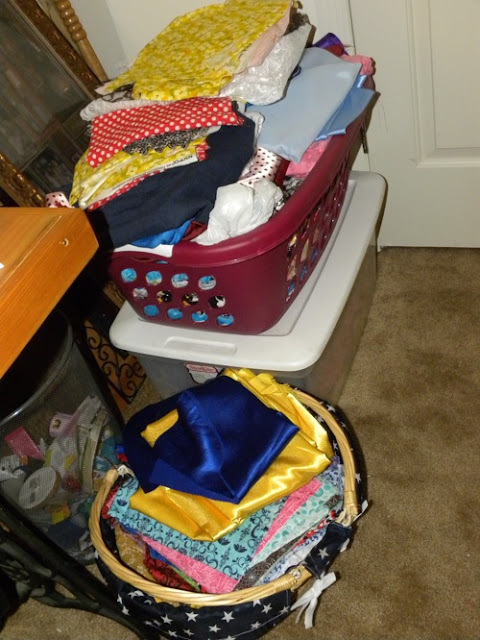 Everything's in one place and I won't have to lug my machine out every night, and all the fabric, and then scramble to put it away if the girls wake up! I'm so happy to have a work space! This is so wonderful! 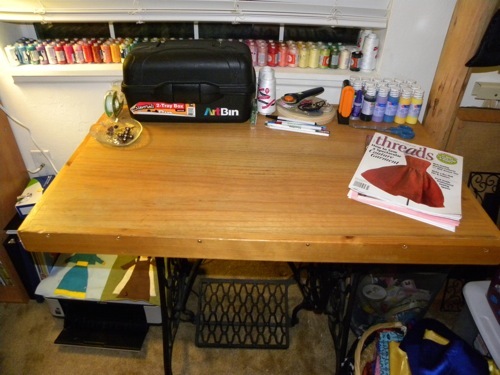 I love my office, sewing, music space because it is so there for me the way I need it to be. I hope you get the same joy out of your work space. I'm impressed with all the materials you have. And so organized! Glad to see you have the Sew What books too! My studio is almost never tidy, between all of my projects and Susi gets into everything! I'll have to start doing some crafty book reviews too, so you'll have some good recommendations to add to your library :). That looks great! All my sewing and craft stuff is stored in my laundry room and I have to haul it up to the kitchen or dining room whenever I find the time to make something. 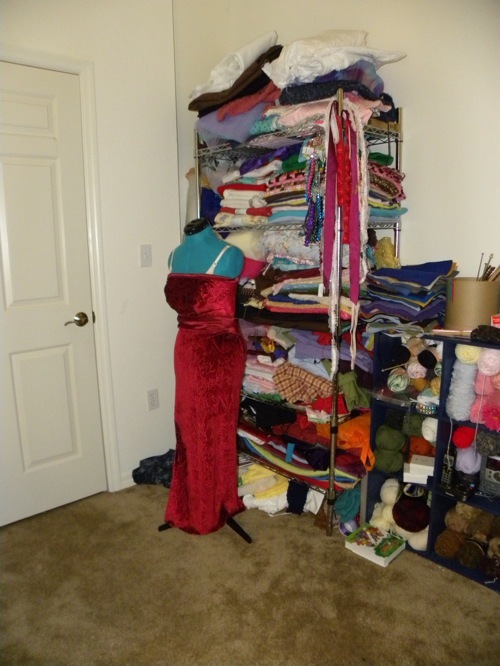 Someday I'll have a dedicated sewing/craft room, but that won't happen for at least another fifteen years or so I imagine. 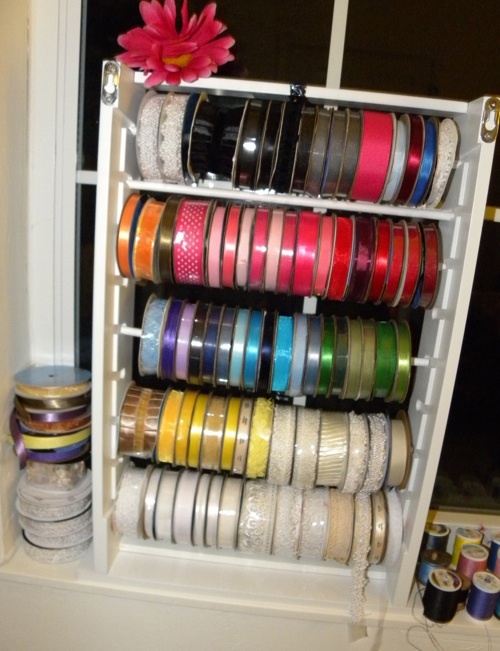 I like your ribbon rack. I need something like that for my ribbon stash. 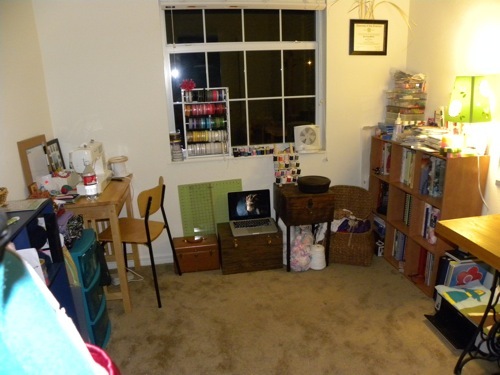 Your craft room looks amazing! It looks almost like a Michael's or Joann Fabric's!